Hot diggity dog! | Stand Up and Speak Out! Chet is half of the Little Detective Agency, the one who sniffs out the perps. Bernie is the other half, the thinking half. Together they make a great team. So what makes Spencer Quinn’s book stand out from all the other detective duo stories out there? Well, for starters, it’s told from Chet’s point of view…Chet the dog. Most of the cases that come to the Little Detective Agency are divorce cases. But one day a woman asks Bernie to find her missing daughter Madison. Hot on the scent, the determined duo hunt for the girl. They suspect kidnapping but don’t know the motive so they go sniffing around her father’s business. To Chet (and Bernie) something smells awfully fishy. Throughout the book I was engrossed in solving the mystery but had quite a few laughs at what Chet was saying. At one point, Bernie says to Chet, after checking out a suspect, “Exactly what I was afraid of…a wild-goose chase.” Chet thinks, “That was a wild-goose chase? No geese?” The book is peppered with clever narration like this. Bernie uses common human expressions from time to time, often ones that Chet doesn’t understand. Chet also gets distracted when conversations between humans drag on and he sometimes repeats things, usually with a “did I already say that?” afterward. 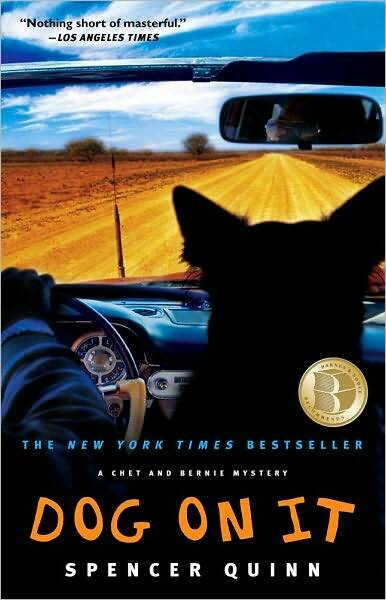 Overall when I read the book, I got the sense that what I was reading was exactly how a dog would think and act. Spencer Quinn is now on my list of favorite authors and I can’t wait to read the other books in which Chet and Bernie star. Any animal lover should check them out.